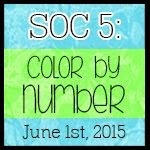 I am combining my De-Stash project with my Journal 52 prompt which was "coloring book." I love Snoopy. He is brave, adventurous and funny. When I saw the Journal 52 prompt I knew I'd finally use one of my Snoopy pages. 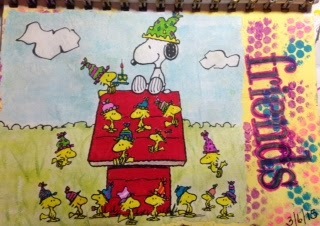 I had so much fun coloring all the different hats on Woodstock and his friends. I used Sharpie markers because I wanted to use watercolor on the background of the coloring book page and didn't want the colors to run. I use acrylic paint and a piece of sequin waste for the circles on the background of the journal page. I knew when I saw Woodstock throwing Snoopy a party that it was time to get out my old but well used, Hero Arts, Friends stamp. 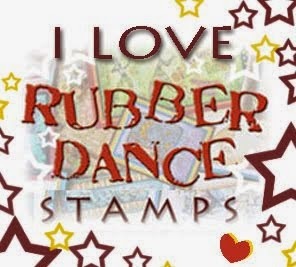 I've had that stamp in my stash for at least 10 years. I was happy use it again. I hope you will play along and post something you've made from your stash. It can be any art form: paper, fabric, yarn, ribbon, paint etc. The only rule is that part of your piece must be made with something you've had for at least a year. A very excellent party page Boo. Snoopy is always a favourite I think; after all what's not to love about Snoopy and all his Peanuts friends. I put my link in the previous post but I've added it here too in-case anyone else would like to visit, hehe. Adorable..snoopy was so popular character in my childhood! Fun art!